Temple Emanu-El is a spiritual, cultural and social center of Jewish life for those who live on or visit the island of Oahu. It is Hawaii's largest and only affiliated Union of Reform Judaism (URJ) Jewish congregation. It is our mission to help one another feel closer to God's presence and kindle the divine light within one another. This goal is accomplished through meaningful prayer, attainment of wisdom through study, Tikkun Olam and cultural/social events. It is also achieved by having facilities which befit an inspiring Beit El or house of God. At Temple Emanu-El, we’ve added aloha (love from Hawaii) to our treasured Jewish concept of shalom (peace) to create our own greeting. We hope that you will feel our warmest shaloha every time you enter our special Jewish place in Hawaii. 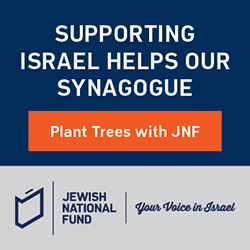 Temple Emanu-El has teamed up with the Jewish National Fund to help celebrate your special occasions by planting a tree in Israel! Keep up with the latest Temple Emanu-El news and service information!